Noah has been working on his pincer grasp (which is a huge milestone for any child) for awhile and he has not quite mastered it yet. Noah is motor driven, just not fine motor driven. We’ve talked about the development of a child’s grasp previously and how understanding your child’s grasp determines what they are able to interact with from food to toys. Once I understood Noah’s grasp, I realized that I was asking a lot for him to pick up puffs at 9 months of age and so I switched to a banana which he was able to bring to his mouth with ease. Our occupational therapist has given us several activities to work on to help him develop his pincer grasp which is last stage of grasp development. Feel free to try some of these with your child. Socks make an inexpensive occupational therapy tool! Our occupational therapist told us we could but socks on his hands with a hole cut out for his pointer finger and thumb so that he can only use his pincer grasp to pick things up. We were not big fans of this, but it does work. Putting pick up foods in an ice tray forces Noah to use just his pointer and thumb to pick up food. It is the only two fingers that fit down into those tight spaces. I will admit this works great and Noah used those fingers without problems with this method. We should do this more now that I am thinking of it. Check out that grasping awesomeness! This is an activity that must be closely watched as you are going to use items that are marked for age 3+ due to choking hazards. Our therapist likes to use Pop Beads. She buries them in therapy dough, Theraputty (that is what they call it, it reminds me of silly putty) and Noah has to pull them out. It is much easier to get them out when you use your pincer grasp than the other variations. We do this almost every therapy session. Has your child mastered the pincer grasp yet? What activities did you do? You are an awesome dad, and you have an amazing kiddo. Watching the videos brings a smile to my face! 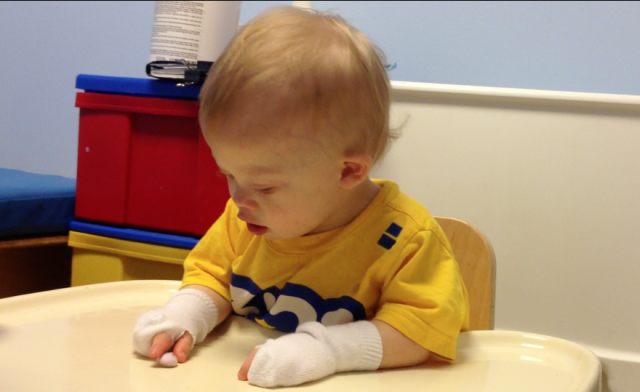 So cute with those socks on his hands….go Noah! Thanks! He’s rocking it, huh? way to go noah love your socks your rockin the grasping thing there is a eattable playdough recipe online for the one that you hide the thing in the dough that way if he eats the dough it wont hurt him its koolaide n someother stuff that is eattable . my kids love to play with it then they can eat it if they want when they are tired of playin. I recently tried to reach you via email, but didn’t hear back. Knowing how it is with so many emails coming into everyone’s Inbox nowadays, I thought that maybe posting a comment would be a quicker and much better way to connect. I am working with a very special lady, Dr. Julia Kinder, who has an 8 year old daughter with Down syndrome. We’re trying to promote A PETITION REGARDING DOWN SYNDROME and I thought you would be a great resource to help spread the word. Your time and efforts are so important as we try to change the stereotypes surrounding Down syndrome – dispelling the myths – and as we try to CHANGE THE WAY IN WHICH THE MEDICAL COMMUNITY PROVIDES RESOURCES TO NEW PARENTS. We can only achieve these goals with your help! How old was he when you started doing this? My son is almost 10 months old and likes to eat little puffs and yogurt bites. I might try the sock thing when he eats becase he grabs with his whole hand and can never get the food in his mouth. By the way, have you talked with your child’s OT about having them help you with this? Thanks! How old are your children by the way? I loved watching Noah look up and completely miss the yogurt bite he was going for, but still bring his hand to his mouth anyway, because James does that ALL THE TIME! I’m always telling him to pay attention! We use sticky’s and sticky tabs to work on Elsie’s pincer grasp. She has to pull out the sticky tabs, which can be hard ..but she does a great job. We also stick the sticky’s on different parts of her body — hands, head, feet etc… so she has to reach for them to take them off, also helps with spatial talents. She is 12 months. It’s a fun game for us and for her! I’m sorry, our question was cut off. Our question……How do we know if Sophia is motor driven or not? She is in PT & has ST 1x a mth. However we are about to increase ST.
We struggle with getting her to pick up puffs, yogurt melts or any food item for that matter. Any help/advice is greatly appreciated. Motor driven by my understanding is that a child will want to get to whatever they are interested in by whatever means they can, where as an observer will not be motivated to get there but will want to check it out from where they are. In terms of grasp that is going to be more a fine motor skill and something an occupational therapist would focus on. You might want to try something larger for her to hold onto like a banana in terms of being successful at self feeding. 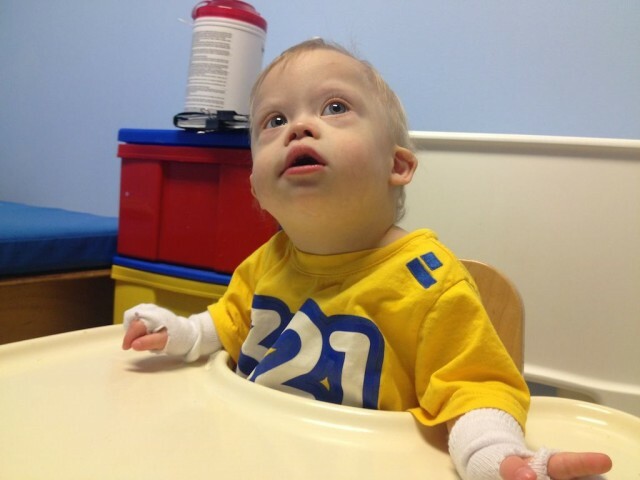 Check out our post on grasp and self feeding which may be helpful. 🙂 glad you guys are doing well! Is she trying and not succeeding? I had to push my Colton to do things on his own because he had been relying on me so much to feed him. Food was a great motivator for him once he figured out he could do it and now he does pretty good, but he still uses a raking grasp(2 yrs 2 mths) most of the time. 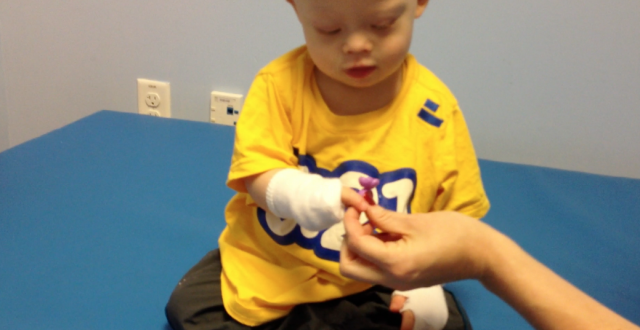 He wasn’t interested in fine motor for the longest time, but now that he’s getting better at it, he has more interest. He didn’t seem to be motor driven until he could crawl. He would be content sitting and watching what was going on. Now he’s super fast, getting into everything. He’s been thinking about walking, but our kids do everything in their own time, so I just keep trying to encourage him. we can reach out to you all & get advice. We will start trying her with banana slices & having her “play” with her food. Hopefully she’ll like that and begin trying new foods. Thanks again for your suggestions. My little guy does his best pincer grasp when I pincer grasp a gold star sticker or other tiny sticker myself and then pass it to him. There’s really no other way to take it from me other than to use a perfect pincer! My son is about to be 13 months old and has not mastered the pincer grasp yet. I tried socks on his hands and he ripped them off. The ice tray didn’t wort because he used his pointing and middle finger together to get the cheerio out. My son is right on track in all other things babies his age are doing EXCEPT the pincer grasp. He still grabs with his whole hand and has no problem feeding himself. His pediatrician is going to have an early intervention specialist come to our home to evaluate him. She said it may take a while and in the meantime to work with him. Do you have any other helpful tips? I try to make it fun for him, but, he just gets so frustrated!